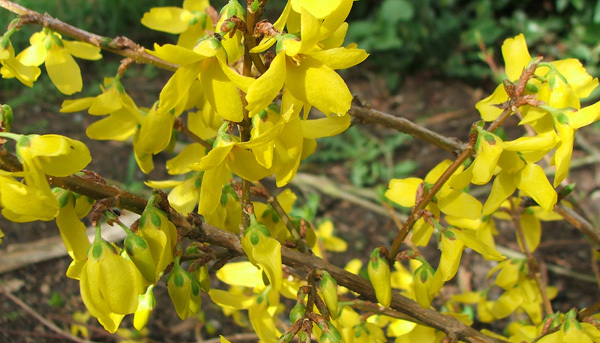 Forsythias used to be all the rage for suburban gardens. A succession of shrubs would grow along the fence-line, just one of each. The blooming succession went something like this - first a Wintersweet, then a big blobby pink (or red) Camellia, then a bright yellow Forsythia. Things aren't quite as linear and small-minded in my garden. Nor do I necessarily have many old-style suburban shrubs - and I'm certainly allowed more than one of each. But I did dig out and burn an original Forsythia which was growing in an area I wanted grassed. This naughty act is well recorded in a very early journal - it's one of my first moments of glorious garden guilt, an original sin... Hmm... I know I didn't take spring flowering shrubs seriously enough in the early days as a country gardener. But my budget Forsythia replacement (cutely called 'Goldilocks') has finally helped me bury the past and move on. And this shrub does complement the bright yellow trumpet daffodils which grow nearby. There can't be too much yellow in the spring garden.